Ok, my new 40t from imr batteries arrived today and they are very different. The 40t from fireflies has different writing, ring around the negative, and is actually longer im doing a few tests on my opus charger to see what I see. !https://i.postimg.cc/kXVL8pq4/8-A5-C25-FB-923-C-419-A-8-FE8-A84904-BB031...! My second E07 came in today, silver version with XPL-HI 4000K emitters this time. I ordered a Samsung 40T too, from Fireflies. 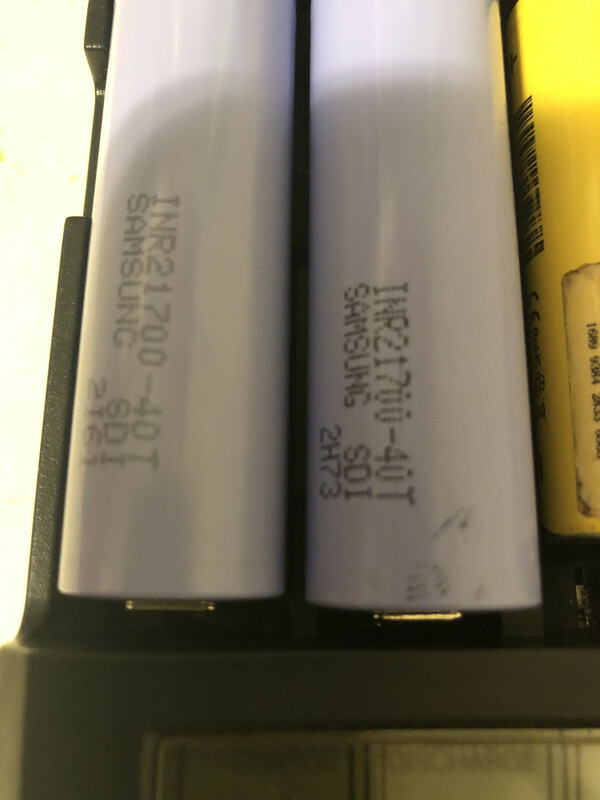 I have no genuine Samsung 40T to compare, but the battery that came from Fireflies has no ring on the negative (just a light round scratch probably caused by the spring when screwing the tail cap). It is not crushed either, probably just the right length. Now, just from the font on the writing, it is really hard to tell if it is a genuine Samsung without anything to compare. It says: “INR21700-40T, Samsung SDI, 2IA2”. Can anyone confirm that all confirmed fakes so far had a real ring (not just a scratch) on the negative? Other than that, I can’t say I’m a big fan of the silver finish. Someone said earlier he/she feels like the light comes from Walmart with this finish, and I kind of agree. I do know the build quality is actually great and the body is very well designed, but there is a bling bling side with it that I don’t really like. I’d be happy to trade it for a grey one if anyone is interested. [Edit] Looking at the “21700” digits on your fake 40T, it seems that the font is better on mine. Could you please measure the spacing between the right of the text and the negative end of the battery? It seems to differ significantly between both. I can also see some faint codes elsewhere on the wrap: N40T, IA901, C11, EA, C6, W1B. But they are all very hard to see. The battery weighs 68.2080 g (yeah, it’s an accurate balance :o). If you are quoting me I was saying that I don’t like shiny black lights, and they remind me of Walmart lights. I was saying that in response to posts of people not liking the dull Black and Tan. Sorry, I misunderstood, I thought you were referring to the silver finish. Then, I am now adding that I don’t like shiny silver as much as I thought I would, because they look like Walmart lights. It’s not that bad though, but I would clearly prefer a mate finish, like stainless steel. I think what I dislike really is the shiny aspect too, more than the silver, as I would not like a shiny black either. 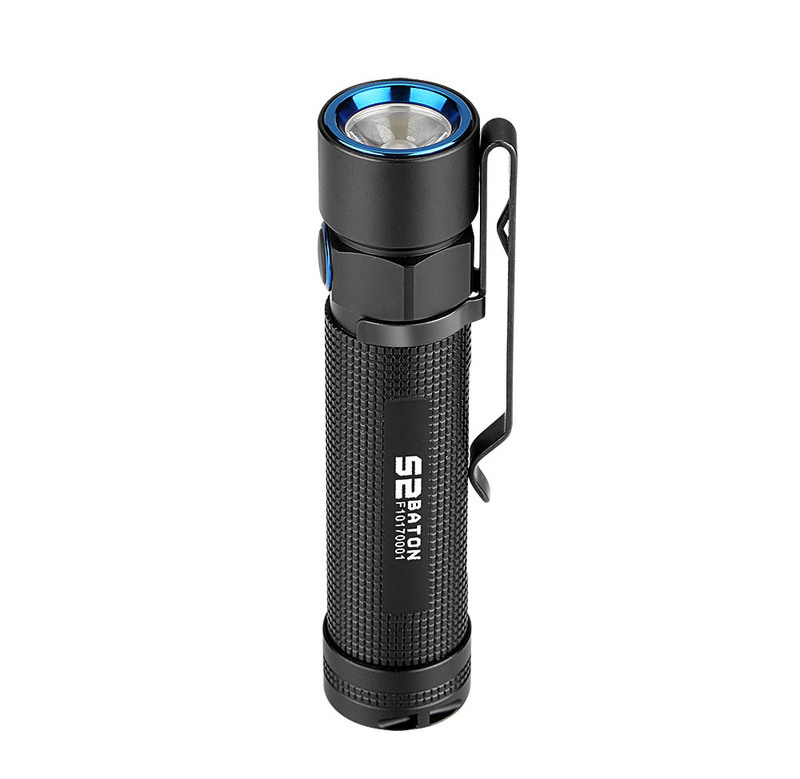 I guess you guys would like the looks of the Amutorch X9 w/titanium tube, or the Amutorch AX3 head then - it's a dull/matte finish which to me looks cheap. 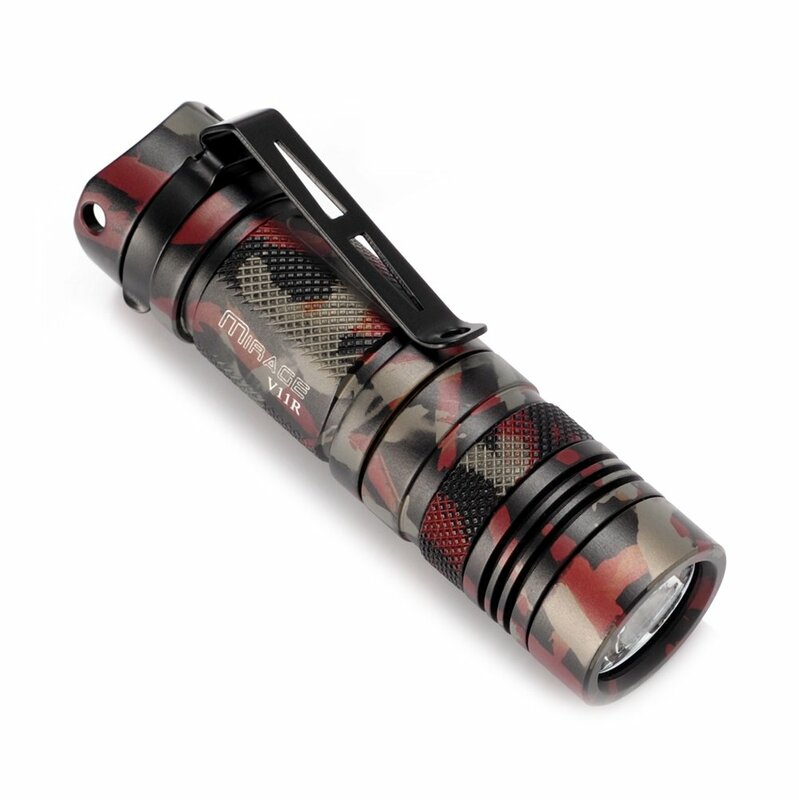 I prefer the shiny titanium of the D4Ti tube, and shiny polished copper for flashlights. Even the SS bezels on the Amutorchs are a dull matte finish. I think the E07 clear ano version looks great as-is and doesn't look cheap at all, but when I think about it, for bathroom/kitchen fixtures I prefer the matte nickel or SS finishes vs. polished chrome. I’d be happy to trade it for a grey one if anyone is interested. What emitters and aux colors does it have? I think the X9 bezel is titanium . Calibrate the temp and set it lower. It works at any level above 380mah i think. Yes, it's listed as titanium, so is the AX3 I have that has the same look to the bezel as the X9. But again it's the finish/look. The titanium tube on the D4Ti is more shiny, so probably personal preference what you like better. I dropped the AX3 on my cold asphalt driver the other night and got a slight nick on the alum tail and also on the bezel. Least for the bezel, can probably sand it out, but the black anodized tail is not so easy unless I strip the ano off. So I received my E07 today (SST20 95 CRI, clear anno) directly from Fireflies. The head was not glued, as ordered. The optic’s leg was broken off like most of the others – probably the old batch. Screws are intact though. My Samsung 30Ts I ordered from NKON seperately fit in there pretty good – I don’t have a giant solder blob on the front spring like most people seem to have – looks decent. I can see through the holes of the PCBs that mine too has no thermal paste whatsoever beneath it. However, from what I can see, the MCPCB sits flush on the shelf of mine, heat transfer is also immediate. I will open it to attempt the emitter swap anyway – then I will see more. One thing I immediately noticed though is, that the battery tube has a slightly different gloss than the head and the tailcap – it’s glossier while the head and tailcap are more milky – are they made from different materials? One very interesting thing: Fireflies claimed earlier, that the SST20 would turn blue immediately with a Samsunug 30T no matter how good the connection between the MCPCB and the light would be. This is not true for my light. Mines didn’t turn blue even when I kept it on turbo and it started regulating itself after some time (battery fully charged of course). 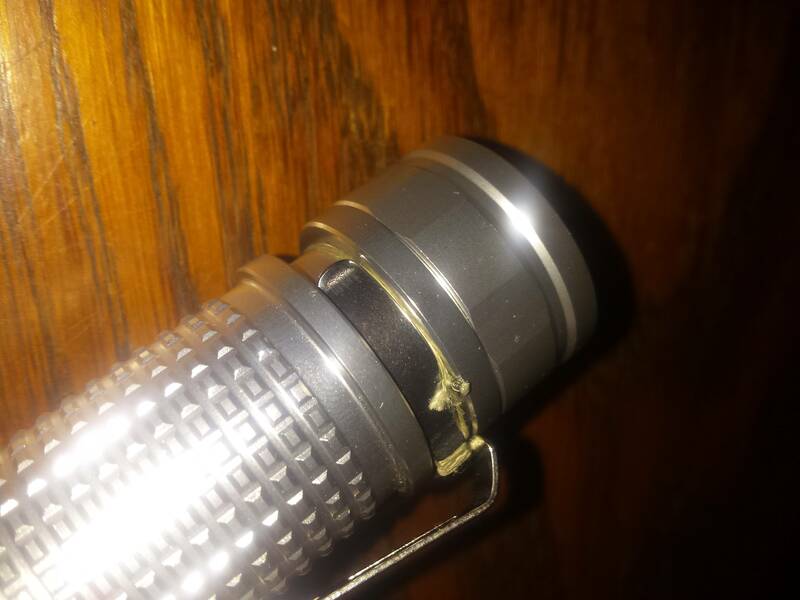 Another thing I have seen people mentioning only briefly: My E07 has the shittiest pocket clip I have ever seen. It’s so stiff that it just pops off when you try to open it enough to clip it onto your jeans – the clip’s connection to the light is just much weaker than the force needed to open it enough to fit any material in between. It’s completely unusable on mine. Other than that – it works as far as I can see. Aux lights works, main lights work. The switch feels cheap and mushy but for me not as catastrophic as many people seem to think it is. After using it a couple of times it feels pretty natural. By pocket clip, you mean the anti roll device? I've been flexing mine and got it opened up enough to work pretty well.The clip no longer is in contact with the tube. On a 40T pulling over 23 amps initially, I didn't notice any blue as well on the SST-20 4000K's. 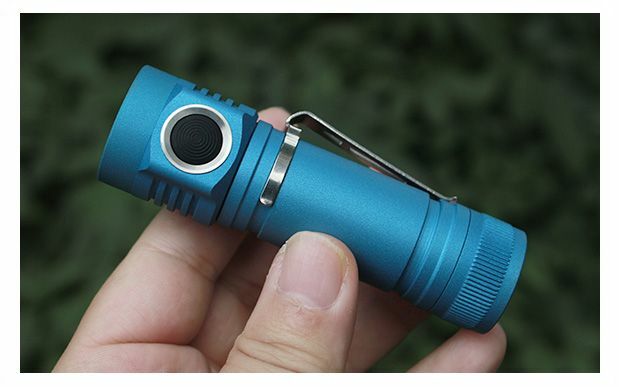 I guess you guys would like the looks of the Amutorch X9 w/titanium tube, or the Amutorch AX3 head then – it’s a dull/matte finish which to me looks cheap. 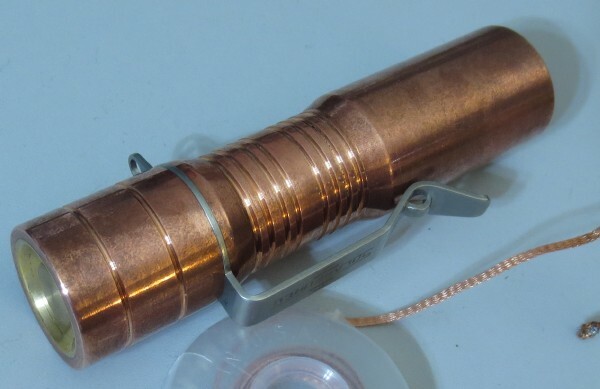 I prefer the shiny titanium of the D4Ti tube, and shiny polished copper for flashlights. Even the SS bezels on the Amutorchs are a dull matte finish. I think the E07 clear ano version looks great as-is and doesn’t look cheap at all, but when I think about it, for bathroom/kitchen fixtures I prefer the matte nickel or SS finishes vs. polished chrome. I would definitely like a nickel or titanium finish. Emitters: XPL HI 4000K (barely used so far, since the battery I received it with is already in low voltage). Auxiliary: purple and red for low voltage. Actually I live in Europe, so Walmart is just a concept for me. I was just trying to express that this shiny silver metal does not work with me because it is too fancy and does not necessarily go with quality in my mind, and I prefer the (perhaps more sober) matte materials. Personally, I love the look and feel of the shiny E07. However, if you really find it too shiny and want to dull it down, there are better options than taking a scotch bright to it. It’s shiny because there is a layer of clear anodizing on it protecting the aluminum and preventing it from oxidizing. If you want a duller appearance, just remove the anodizing. The simplest way is to soak the light in something that removes anodizing. I use Greased Lightning from my local hardware store. But you could use drain cleaner. Even bleach might work, but could take forever. The safest way to do this is to disassemble the light and soak the bare aluminum parts. However, for this light disassembly is quite an operation and would require careful soldering. For those not comfortable attempting that, the next option is to soak the light whole. Before soaking, I recommend checking and lubricating all o-rings. The light is going to be immersed in liquid for quite some time and you don’t want corrosive stuff leaking inside. You may also want to tape off the the bezel or other parts that you don’t want to become damaged. I’m not sure if Greased Lightning will affect steel, but I don’t think I’d want to risk it. I use vinyl electroplating tape for masking. For safety, I recommend against soaking the light with the battery inside. If you need more weight to make the empty light sink into your soaking solution, fill the battery compartment with a stack of coins. 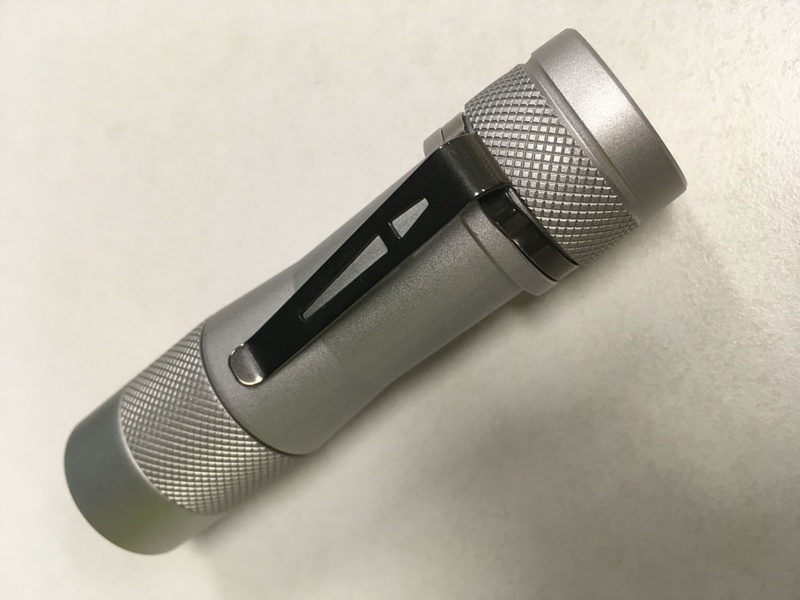 After the anodizing is removed the light will be a dull raw aluminum color. This will naturally oxidize to a slightly whiter color over time. Anyone receive a colored anno unit with beveled fins yet? I really love that gun gray, but also like the chamfered fins of the clear version. Woo-hoo, DHL tracking FINALLY updated (this was the first actual scan and first actual log entry other than “awaiting item”) and my light is in Cali, should be here Tuesday! By pocket clip, you mean the anti roll device? Yeah… This style of pocket clip was going around a while ago, 2017 and 2018, from multiple brands. I’m not sure why that happened, but I don’t like it. Maybe it was a fad, maybe someone produced a huge amount and sold them cheap, I don’t know. I’d rather have almost any other style of clip though. However, the rest of the E07 is quite nice. It’s definitely a light I make a point of using regularly, because I like it a lot. 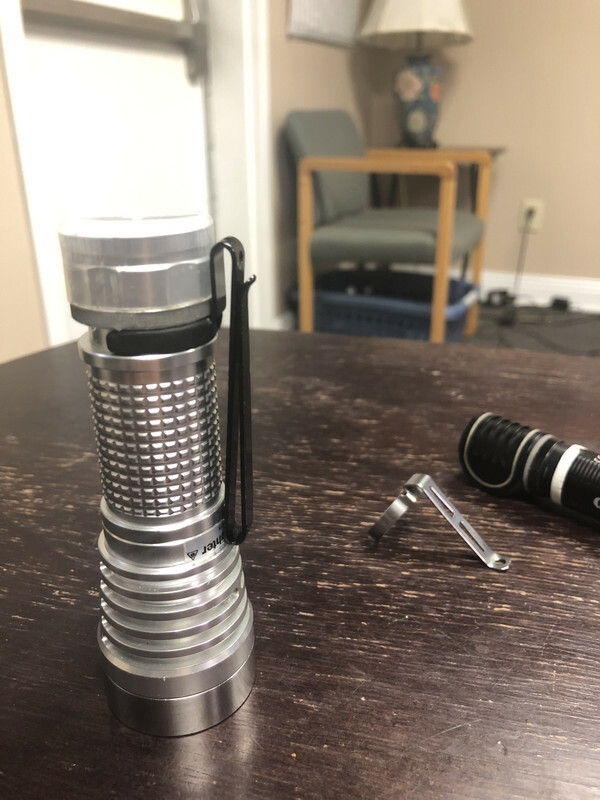 I like this 2 way olight h2r clip better. Carry heads up or down option. That’s incredibly shady of Fireflies. The real thing pumps out a lot more heat, much quicker. I don’t have any way to measure output unfortunately. It might be a shady move from Fireflies. It might also be that they accepted one of the lowest bids and didn’t realize they were buying fakes. In any case, Neal refunded me $6 because he said the fake should be worth about $5. So in the end, I paid $5 for a $5 battery. I’m not upset. My 40T measured at 23.1 amps on the E07 w/SST-20 4000K’s, also from Liionwholesale. Did you receive a fake that you can test and compare? That’s a fair point, absolutely possible that fireflies didn’t know. But, for someone operating in this space acquiring tens of thousands of emitters and thousand of drivers and components, i consider it unlikely to not know who to trust to purchase a cell or how to tell the difference. Regardless, we’re all rolling the dice each time we buy a budget light, and I wouldn’t have cared a single bit if this light was twice the price, I think it’s awesome. The battery deal, and then no official response or offer of making it right is shady. Not sure what point of the clip design you are referring to – do you mean the click-onto-the-tube-style? Because the D4 has one of these too but it just works perfectly on mine. It’s much longer, weaker tension and just holds perfectly onto the body. I had it clipped onto my belt for months and I head zero issues with the clip failing. My Klarus XT2CR lost the clip about twice a day or so. Really annoying. The E07 now loses the clip whenever I try to put it onto ANY fabric. I could try to bend it, but i won’t wear as a pocket light anyway – the head is too big for my taste to do that. I haven’t liked this clip design on any light I’ve ever encountered. 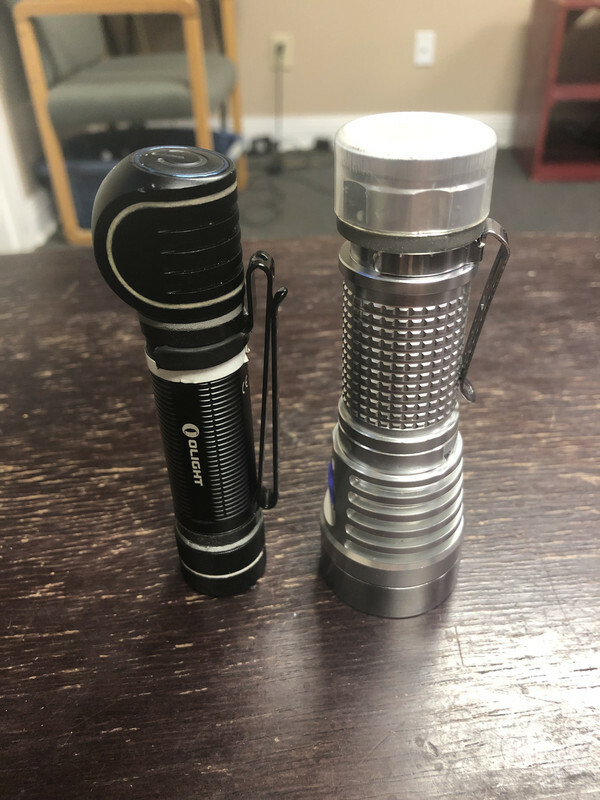 I’d like to see an Olight-style clip instead, ideally with a full ring (like the FW3A, and the SolarForce L2 clip) instead of arms. I also have clear ano with SST20’s and noticed the same thing. MCPCB seems to make full contact with the shelf and the head warms up really fast on turbo. Please report back your findings when you take yours apart because I’d really like to avoid messing with mine. Thank God. The ring-style clip is one of the main perks that I like about FW3A. It would be much less appealing to me otherwise. My E07 has the shittiest pocket clip I have ever seen. It’s so stiff that it just pops off when you try to open it enough to clip it onto your jeans – the clip’s connection to the light is just much weaker than the force needed to open it enough to fit any material in between. It’s completely unusable on mine. I’ve had exactly the same experience, but I think I’ve fixed it just now. 1. Install the clip backwards so that it extends beyond the tailcap. Hold it in place with a thumb so that it doesn’t pop off and pull with an index finger to bend it slightly. 2. Tied it down with a braided fishing line using a trilene knot. Yeah, it doesn’t look pretty (though it’s much less noticeable in person than the picture), but it seems to be very strong (for now). Also, this is my first attempt and I have no experience with “fancy” knots, never had any interest in fishing, so I’m sure it could look better. Good idea with the fishing line. FYI: for those like me without knotting skills I’ve found that a simple double-X knot of Trilene can be made super-durable by applying a little super-glue gel to the knot. Agreed, full-ring would be the way to go. I am very happy that the clip-on was rejected for the FW3A. And I am glad that I did get another clip for my D4, not the first one. I checked my XT2CR again, and the clip is, besides from the color and the holes in it, almost identical to the one of the E07. - where best to purchase? Fireflies or nealsgadgets or…? - is there a discount path still valid anywhere? - planning to get the 6500k emitter, anything I should know? - is the best battery option still a (genuine) Samsung 40T, or has something risen above it in testing? When you purchase, definitely pay for expedited dhl shipping. It’s so much faster. Buy your 40T from a reputable “battery dealer.” There is a thread on here with a discount code for all sellers, but you have to request banggoods code.